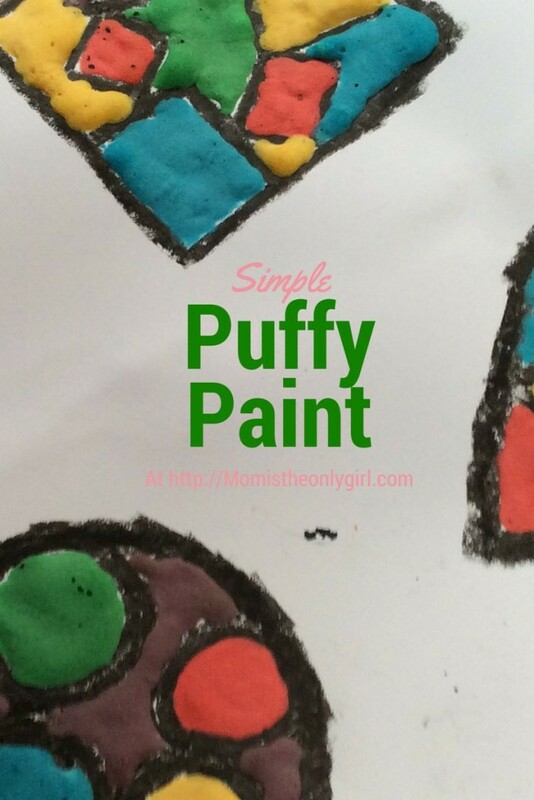 Puffy Paint is very simple to make, so let your kids help! And, as with all cooking projects, be safe – make sure there is an adult supervising and be careful of heated surfaces. Mix the dry ingredients in a small bowl. Slowly add the water until reaching the desired paint consistency, erring on the side of thick. Add food coloring according to your needs. Carefully slide the project into your microwave and “cook” for up to 30 seconds. This is the neat science part – watching the paint puff up! Be careful when removing it from the microwave, and let dry before touching! The boys and I really enjoyed working with this paint again. Of course, they made Minecraft figures, but I painted simple shapes and cut them out to make a little garland to hang by a window. It added so much color to the bland landscape behind it! Have your kiddos painted with puffy paint before? What other paint mediums have your kids used and enjoyed? This is a great idea and one I intend to do with my girls when they are a bit older! Thank you so much! We bring this out every once in a while, especially on rainy days! It seems as the boys get older, this activity doesn’t loose its appeal! I hope you and your girls enjoy it!